Public cloud storage usually saves significant money and resources over in-house storage infrastructure. On-premise storage vendors might try to prove the opposite by comparing just the initial purchase prices to cloud storage, but this is not an apples-to-apples comparison. Fully-loaded in-house storage includes not only capital expenses but also ongoing operational costs, hardware refreshes every 3-5 years, the cost of data migration, support and licensing contracts, and in-house IT hours. Moreover, this headache exists for each storage device. 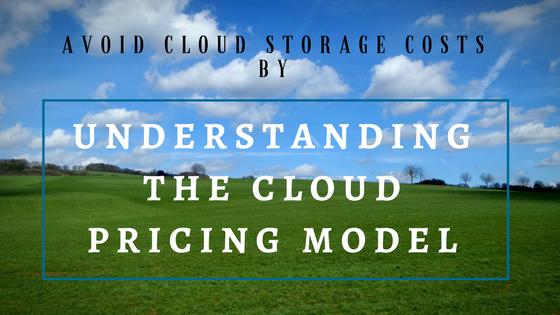 The challenge of understanding the actual costs of storage complicates further when you compare pricing between cloud storage services. That is because the cost models for cloud storage are vastly different from on-premises storage, and pricing can vary from cloud storage provider to provider. Pricing models for cloud storage infrastructure have fees for monthly cost per gigabyte of stored capacity. The fees for data transfer bandwidth (aka. egress) are usually discussed with cloud storage pricing. However, what is easy to overlook are the activity costs for storage. The primary cloud providers (Amazon, Microsoft, Google) also charge for distinct storage transactions to put, list, and delete objects in cloud storage accounts. Keep in mind that the costs for both storage and storage activity vary depending on the storage tier. Cloud storage tiers suited for active data workloads have higher costs for storage and lower costs for activity. Tiers that are optimal for long-term retention are the inverse: Low monthly storage fees with higher access prices. Depending on your object count and how your applications interact with storage, activity costs may or may not be a factor for you. While at first glance, the storage activity prices appear to be tiny (e.g., $0.05 per 1,000 operations), they can become significant when you have large object counts or transaction rates. Email, event logs, and IoT workloads easily reach into hundreds of millions and billions of objects, and this is where activity costs matter. The following image is an example of the proportionality of storage activity costs associated with seeding 800,000,000 objects into a secure cloud archive environment. space, plus capacity for future growth. Redundancy Copies By default cloud storage makes three (3) copies of your data – and you don’t have to think about it. You can upgrade to have redundancy to a secondary datacenter. You need to procure additional storage for local redundancy and offsite copies too. This may have additional costs such as backup software, backup appliance support contracts, and 3rd service providers. have a miniscule costs associated with storage operations (each write, read, or modify touch of your data). Since you own the infrastructure there is no tangible cost associated with basic use of your storage. Facilities, Power, Cooling The cloud storage vendor bares this burden so you don’t need to worry about it. Often overlooked or obscured, floor space and energy have real costs associated with in-house storage. Vendor Support & Maintenance Often bundled in to the subscription fee for the life of the subscription, but will vary depending on the vendor. Vendors often bundle in 3 years of maintenance and support, but after 3 years expect to pay 15% of the original purchase price annually. requiring data to be migrated to new hardware (and migration can be costly and painful). The trick with cloud storage is to optimize your use of the different storage tiers in the cloud as data ages in its lifecycle. Otherwise, it is possible that your cloud storage costs might swell to the point that it is no longer an economic advantage over on-premises storage. To understand if the cloud will work for you economically, you must look at your data activity type and usage and identify the appropriate cloud storage tier. One of the best ways to mitigate storage spend in the cloud model is to manage data intelligently based on the usage profile for each workload. Active data that frequently transfers in and out of the cloud should be placed on a cloud storage tier that is cost-optimized for active workloads. Likewise, for long-term retention workloads that see little access activity, taking advantage of the lower-cost storage tiers for cool and archive workloads will help you optimize your cloud spend. Moving many of your applications to the cloud is likely going to save significant money and resources over on-premise infrastructure. However, if your primary business driver is to save money on storage costs, and you have already made significant capital expenditures in a storage and backup infrastructure on-premises, then you probably want to wait until your next hardware refresh cycle before jumping into the cloud. Companies that do well with the cloud are those that start with low-hanging fruit. Long-term retention, archiving, and backup are almost always going to be your best places to start with cloud adoption. The reason for this is that long-term retention data is typically sitting on expensive primary storage on-premises. Moving it to low-cost storage tiers in the cloud is a surefire ways to reduce storage costs while also serving as a release valve to free up space in your on-premises storage. Let’s look at some numbers: storing files on-premises in typical high-performance arrays costs $0.32 to $0.95 or higher per TB, depending on capital and operational costs of the storage medium. Given these numbers, corporations can easily spend $1 million per 100TB as a fully-burdened on-premise storage cost. That may be worth it for mission-critical active data; it is not for rarely accessed information. Thanks to the cloud’s massive scalability, compression, and deduplication, companies can save 85% or more on on-premise costs by migrating inactive files to the cloud. Companies take advantage of the cloud’s massive scalability and efficiencies, without incurring high charges for many data transactions and transfers. If you use the cloud as a simple cold storage tier, then you are going save money. However, there is another consideration when choosing an economic cloud archiving service: intelligent services. Do your due diligence around cloud storage services. Don’t go to the cloud just because it is “cheap” – depending on your data usage, it might not be. And don’t go for just any cloud storage service – it might not support you if you need to retrieve that data quickly. As with any archive solution, you need to plan to have an exit strategy and how you will handle data management, discovery, and audits. What if your knowledge workers need ongoing access to the archived data? This access should be infrequent, or the data is not suited to an archive tier. However, in some instances – litigation discovery, governance audits, fraud investigations, and historical trending for example – your professionals will need to access the cloud archive tier efficiently. Make is easy to retrieve content for business scenarios intelligently, thus minimizing bulk egress which will incur storage activity and egress bandwidth fees. Support in-place data management so that you can satisfy legal holds, access governance, classification, the GDPR, and other data management needs without having to egress content.